I’ve been instructed to write something about it. It all started on a dark and stormy night in 1981… I’ll just skip to the end. On my first day I was given a computer and told to install whatever I wanted on it. Ubuntu away!! I was very happy. After that moment of glee however, it wasn’t all beer and ball pits. I also had to learn stuff. Luckily I was given interesting, challenging problems and the trust to work on them with my own brain. It’s perfect for someone excited about all things open source as Last.fm uses open source tools everywhere. That helps give a warm fuzzy feeling throughout the day, even more so when I was able to make some contributions back. I submitted a couple of patches to HBase, the open source Bigtable-like implementation. There was much digesting to be done. Researching and playing with things like Map/Reduce, Hadoop and HBase was a great way to learn about the future of scalability. It’s safe to say I learned far more than I would have crammed into lectures. Of course, Last.fm is more than just a great learning environment. There’s also being a part of producing something that people really love. People care a lot about what they do at Last.fm and it’s infectious… beware. I’d like to note that there are also certain things that have conspired against me during my internship. Good places in the area to go for lunch made me spend way too much money, a pretty decent coffee machine forced me to make many typos, and getting distracted discovering new music on the Last.fm website caused me to forget what I was thinking more than once. All in all, the whole things was a positive experience that ended in a hug. PS: This capcha is a maniac. 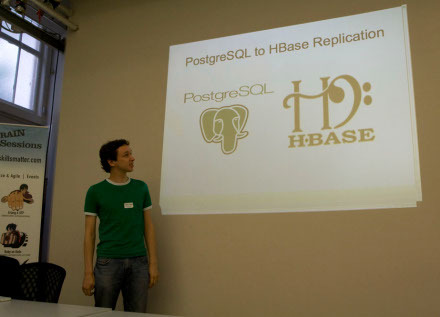 “Postgres to HBase replication”…care to share more on this? How did you afford to live while doing this internship? I was thinking of applying for internships around London but I can’t understand how people can live in London without full-time paid employment.. Thanks. I survived with some savings and lived like student. Depending on the internship there is some money, so it’s not total poverty. Also it’s foot in the door if anything comes up at the end of it. Does Last.fm hire American (residing in the states) interns? Congrats on finishing your 3 month internship!